Has the photo industry neglected one important feature when designing monopods over the last several decades? Steadicam seems to be addressing an overlooked feature with the recently released Steadicam Air 25 that active photographers may find quite helpful. 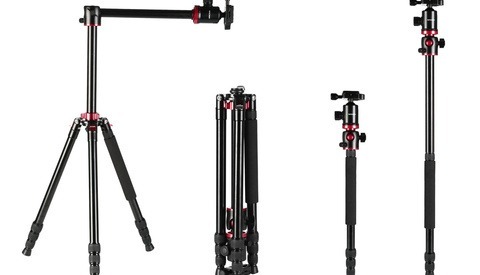 When I was contacted by the fine folks at Tiffen regarding the new Steadicam Air 25, I was a bit hesitant to jump on the opportunity to review a unit based on my limited experience using monopods. After spending some quality time with the Steadicam Air 25, I now understand exactly where a tool like this fits into a busy photographer’s workflow. There are times when a little assistance is very much appreciated. 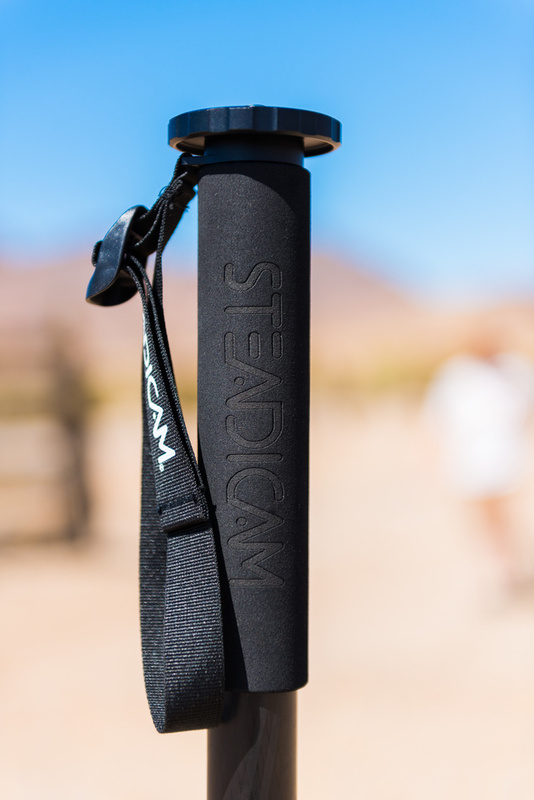 Steadicam has recently added a tool to their line up for your photographic arsenal that provides the very assistance that we so appreciate, via the clever use of a gas assisted spring. The Steadicam Air 25 features a foot pedal activated gas assisted spring which is capable of lifting and supporting up to 25 lbs of your camera setup of choice. 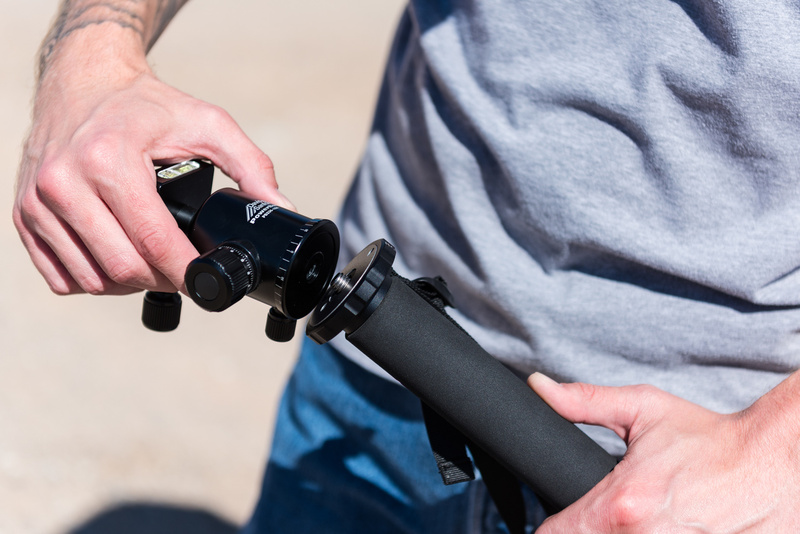 The Steadicam Air 25 features a reversible 1/4"-20 and 3/8"-16 screw to attach your favorite head or mount directly to your camera's 1/4" -20 tripod mount. The Steadicam Air 25 is monopod on steroids. 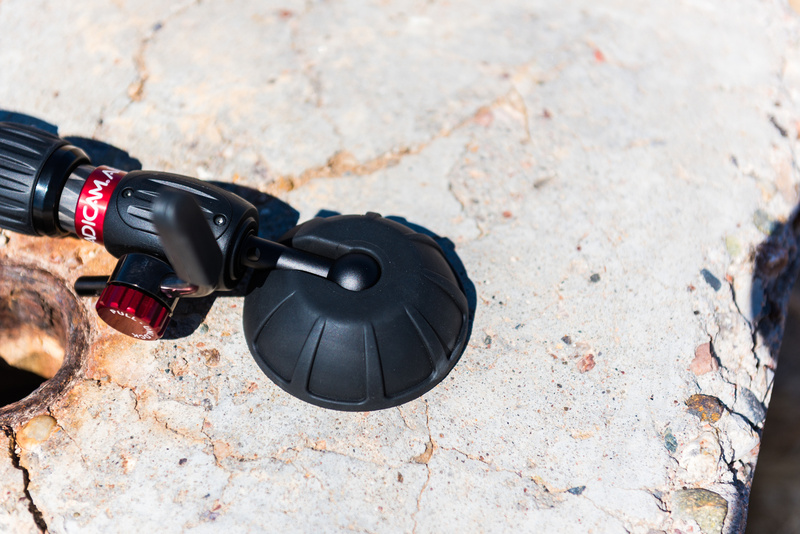 With one nearly effortless motion, you get immediate push-pedal height adjustment, capable of raising 25 lbs of your camera setup of choice in an instant. This process is so much simpler than twisting and pulling and yanking and cranking on the twist locks we’ve become accustomed to. The gas powered, foot activated assist can raise the base of the monopod from 28 inches to a maximum height of 62.5 inches. 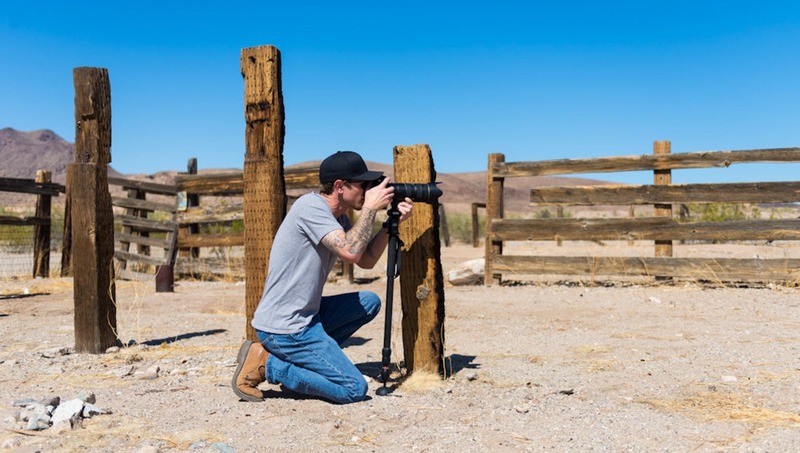 It is this type of assistance that so-called “run-and-gun” photographers such as sports, wildlife, and event photographers will appreciate. You know, those of you who have to spend hours at a time with camera(s) in hand and at ready. One thing I can appreciate about nearly any monopod or tripod is their ability to take the load of your camera and lens (or whatever you choose to mount atop of one) off of your hands and shoulders while you’re not snapping those moneymaker shots. This is priceless. Anyone who has had to hold a heavy camera in hand for hours at a time can tell you that it gets old, not to mention the tole it can take on your body. The moment I stepped on the foot pedal and felt the ease at which the monopod rises, I was a bit lustful. 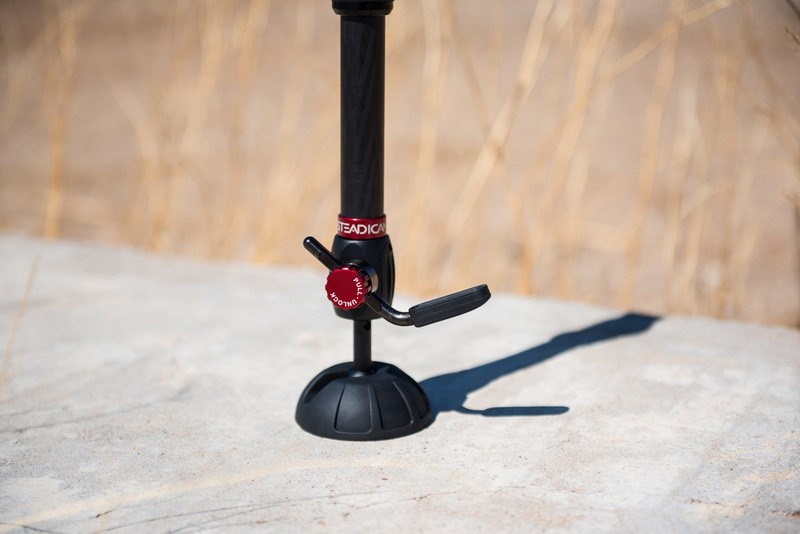 Just think Wayne’s World – “Ssshhhhaaawwwing!” The foot pedal requires minimal effort to depress and the process of raising the monopod feels precise and controlled. The gas-powered assist is said to lift 25lbs, and based on tests in my studio, it does just that. Raising the Steadicam Air 25 is simply a matter of stepping on this lever. 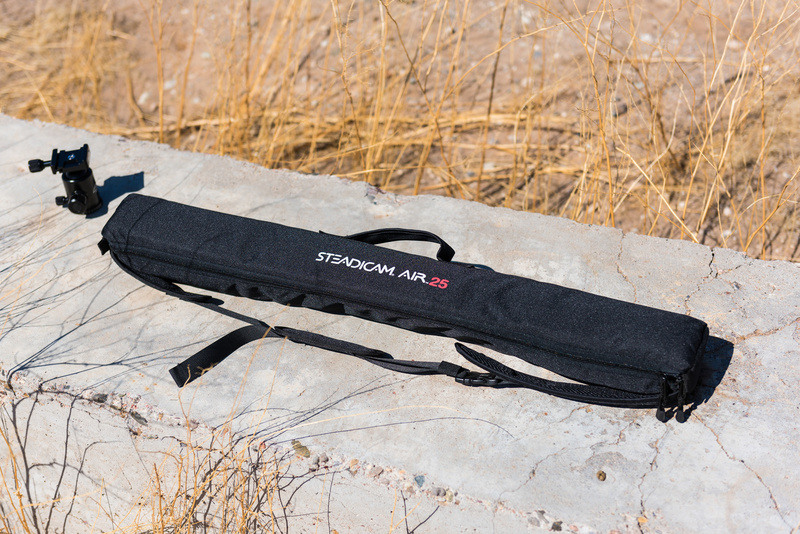 I’m a fan of quality carbon fiber products in general, and the Steadicam Air 25 is made of a handsome blend of carbon fiber and anodized aluminum components. When you pay nearly five hundred dollars for a monopod, one should expect the build quality to be top notch and thankfully nothing about the Steadicam Air – 25 feels cheap. The twist locks are grippy and have a quality feel. 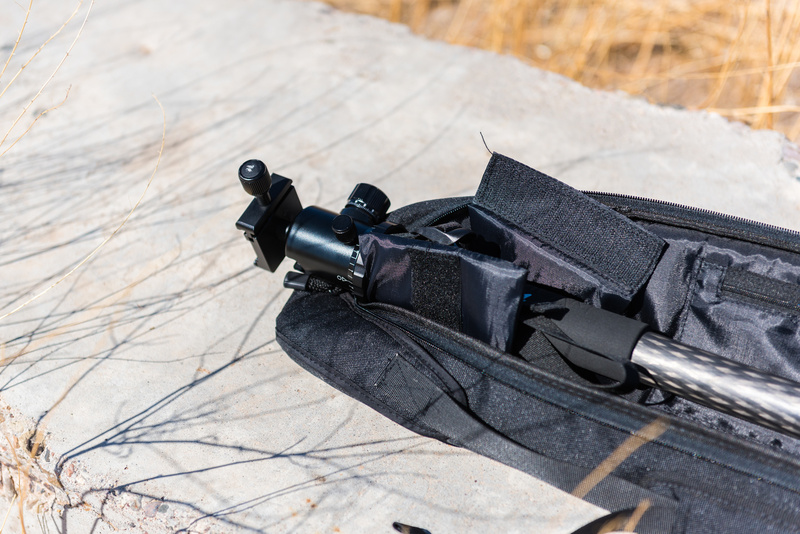 The padded hand grip is a welcome feature, considering if you have any substantial amount of weight fixed to the monopod, you’ll likely be gripping it quite tightly for an extended period of time. The generous padded grip is comfortable in hand. 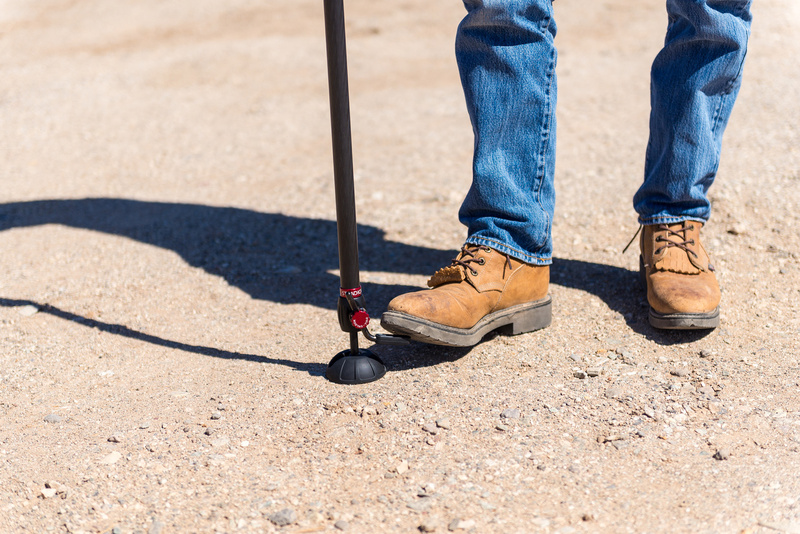 The foot of the monopod is just the right size and allows for unobstructed articulation. This means you’re not going to be held back by the limits of the base while using it. The foot is grippy and inspires confidence while searching for a place to set it down and pivot from. The base of the Steadicam Air allows for unrestricted movement at any angle. 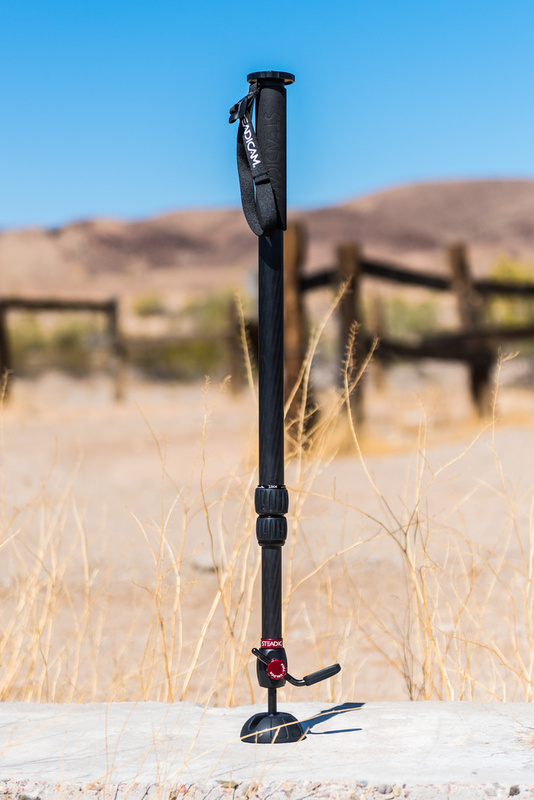 The monopod without a head attached weighs in at 3.5lbs. For something that can lift such a bulky load with ease, 3.5 lbs feels extraordinarily lightweight in my hands. Aside from the price of the monopod being a bit painful to swallow – currently five hundred dollars via B&H Photo – there’s not much to dislike about the Steadicam Air 25. One thing I always tend to be a bit particular about are the cases included with items such as this one. While the case that’s included with the Steadicam Air 25 seems to be well made enough to last, it could have been designed with a few very welcome features, such as a pocket to hold a ball head or accessories. The case would also greatly benefit from being a few inches longer, as the unit will not fit inside the case with even my smallest ball head attached. Alternatively, you could just mount it directly to the bottom of your camera using the 1/4 screw and your camera's tripod mount (the tapped hole on the bottom of most cameras). I still prefer to use a ball head. The included carrying case could benefit from a few extra features. The carrying case is not long enough to fit the monopod inside of it with a head attached. 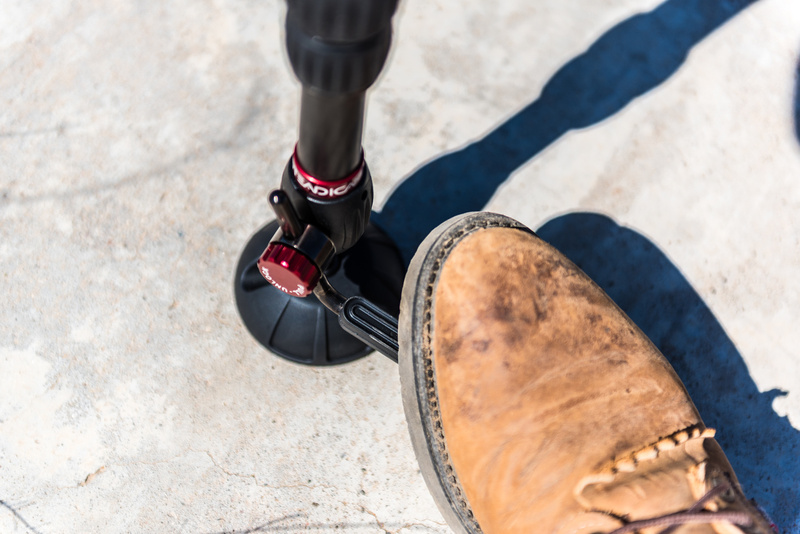 While the gas assisted spring and foot pedal combo make raising the monopod a precise and effortless process, to collapse the monopod you must step on the foot pedal and press down with roughly 25 lbs of force. I can understand that this would prevent a heavier rig from slamming down upon stepping on the pedal, however, if you didn’t have to fight that gas assisted spring to collapse the unit, it’d be much more useful. To me, a feature such as the ability to lift the foot pedal up with your toe and somehow bypass the gas pressure to let it fall or collapse freely would be quite welcome. To collapse the monopod, you must step on the foot pedal and press down with roughly 25lbs of force. It would be nice if the process was more controllable and required less effort. The Steadicam Air 25 is Steadicam's entry into what is essentially a new market for them and I’m a fan of the effort so far. Like with other Steadicam products, the Steadicam Air is well made and designed to last. 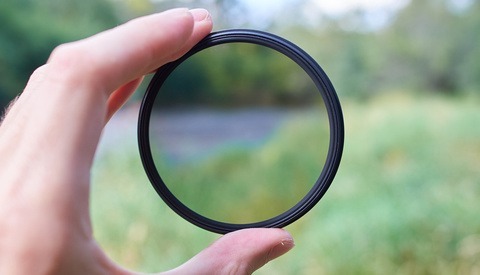 Whether or not the price is justifiable depends on the type of photography you’re into. I know that if I were tasked with run and gun style assignments on the regular, the Steadicam Air would go with me everywhere. 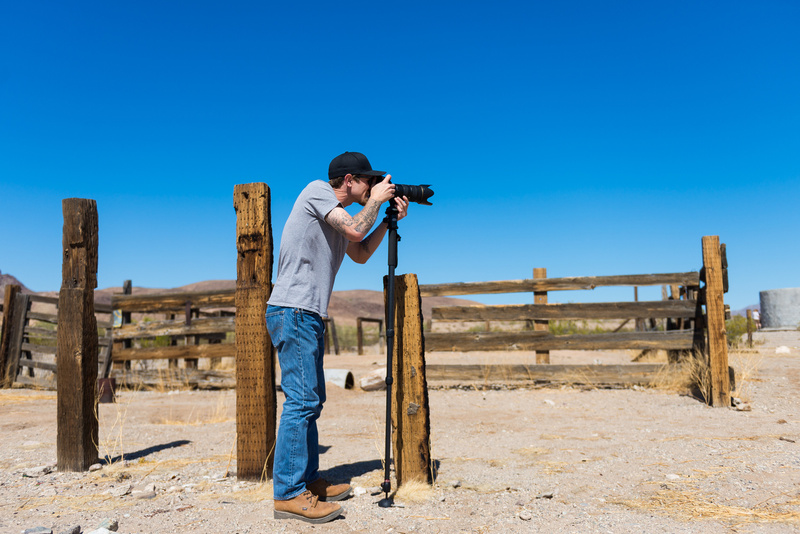 Actually, no, this isn't a new market... pressurized tripods and monopods have been around for awhile. Manfrotto have their own version of this, and Sachtler are famous for their pressure-powered tripod used by news cameramen to take the money shots above crowds. Having said that - it seems like a rather lovely product, and the price is right. I mean it's a *gas* powered monopod... if you really need this than 500 bucks is not hard to swallows since it means you're doing extremely specialized work. nothing beats the manfrotto 679B. I agree...... best monopod I've ever owned. Love the feet on the bottom. 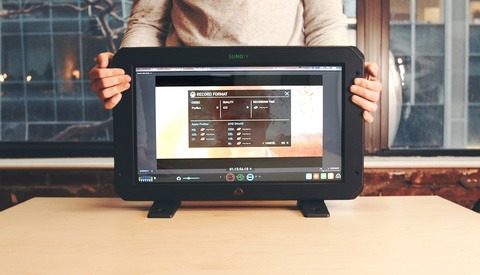 It can free-stand with your camera. no feet on mine. i don't think the B has feet, just the 679. Actually, I think Steadicam (backed by RED on this gear I think) forgot one key aspect with their design here. 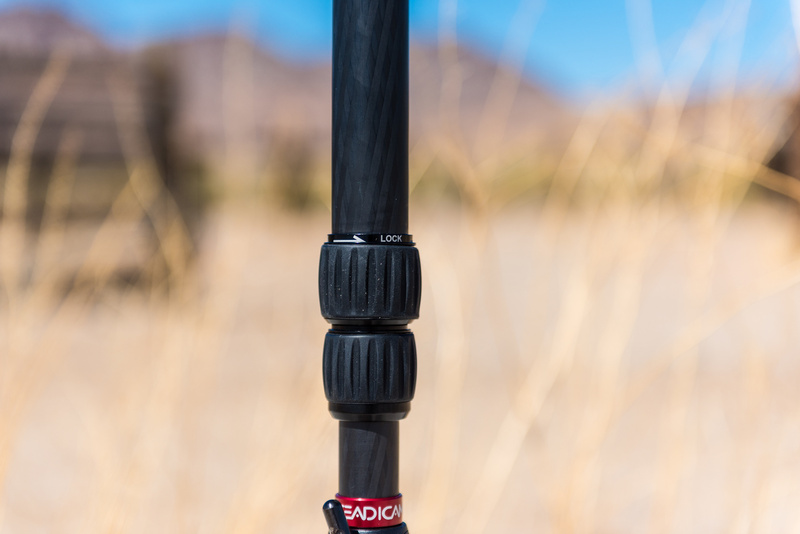 This system could address the most basic frustration of monopod users but does not: the speed of adjusting a monopod with many sections. Having a monopod with many sections is great because that means it can be tall enough AND compact when fold. But with a classic system that also means it's slower to operate than with fewer sections. This gas assist could solve this problem and bring height, compactness & quick operation at the same time. Instead, we're still stuck with a too long monopod to fit in a backpack. That's unfortunate.